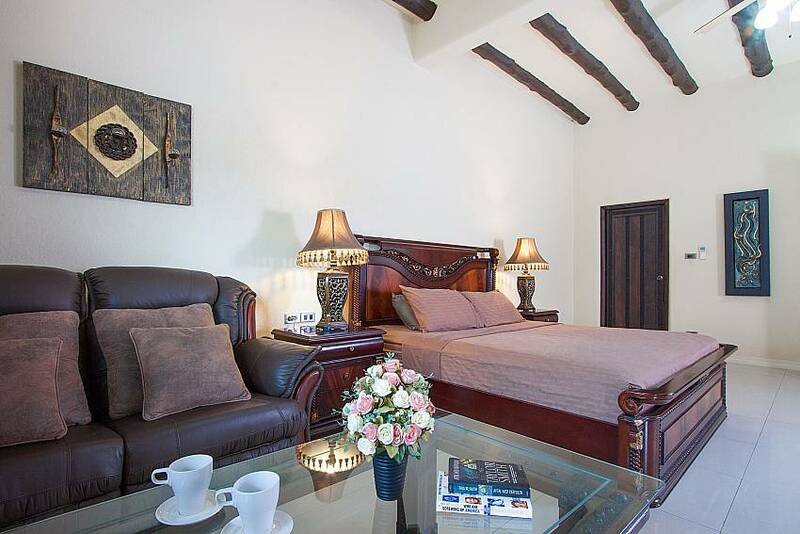 If you are going away with a large group of friends or extended family, Camelot Villa will show you the time of your lives. 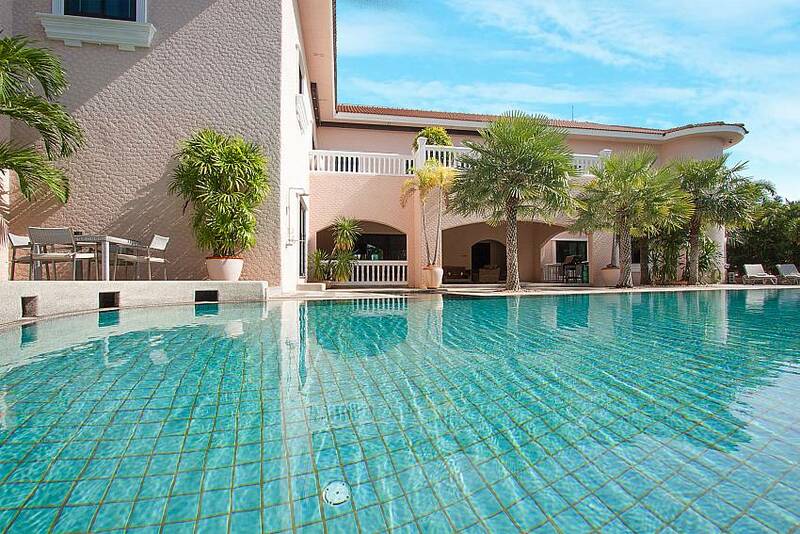 Suitable for 10 people in total and with a strong European flair, this colossal summer rental is simply made for enjoyment and holidaying deluxe style. 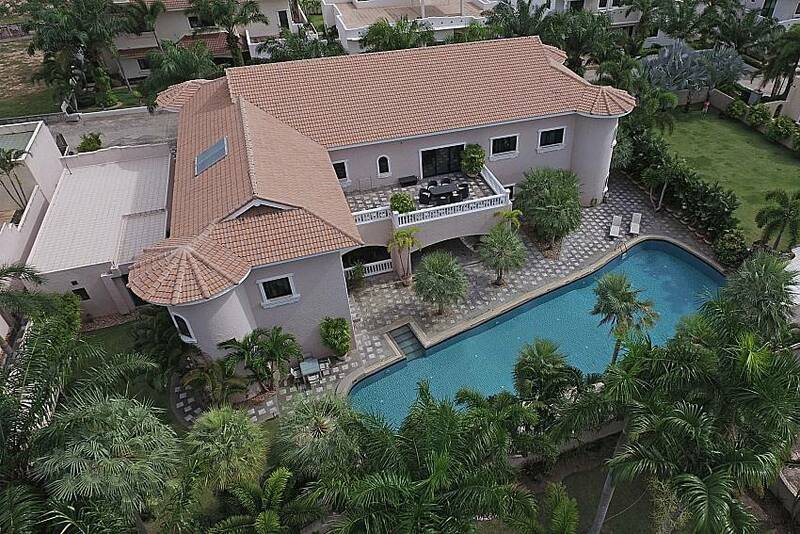 If you are into colossal houses built in Spanish/European style, you will wish for the stunning Camelot Villa to be your permanent home. 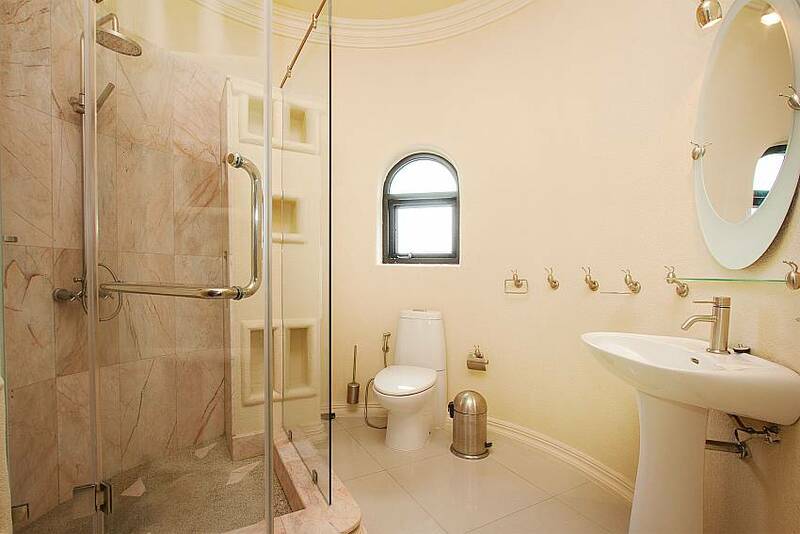 Both its interior and exterior are exquisite, made for admiration as much as for enjoyment. 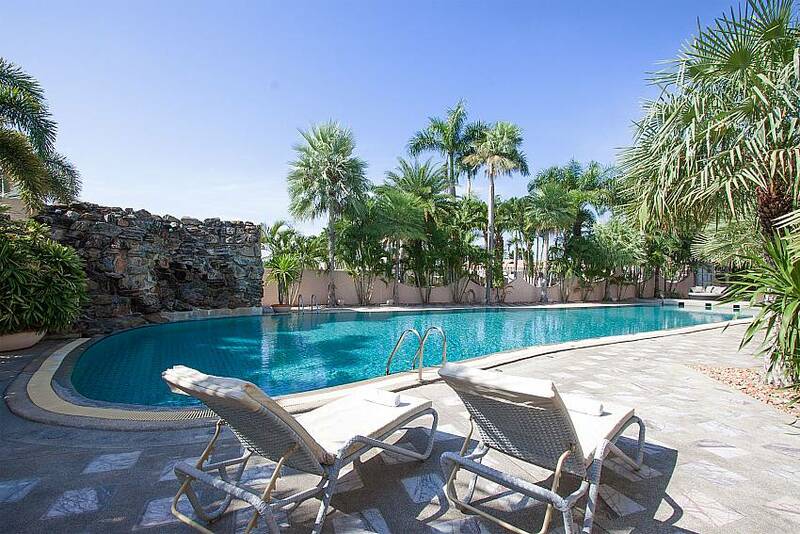 The sky-blue swimming pool is immensely big and inviting, and the pool deck with sun loungers, BBQ and outdoor sofas is the place to spend entire days in. 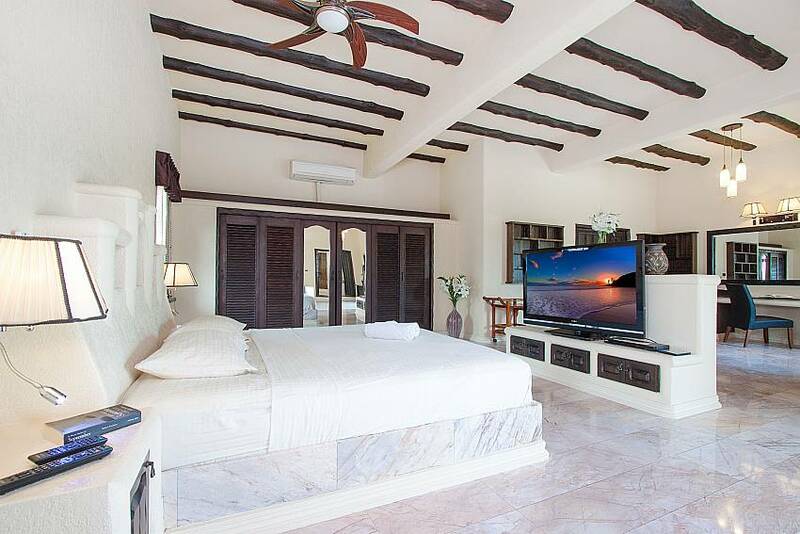 The villa boasts a number of superb facilities such as a bar, wine cooling room, Jacuzzi, gym, small library and a great DVD selection in the cinema-like lounge, ensuring that everyone in your group has non-stop fun. 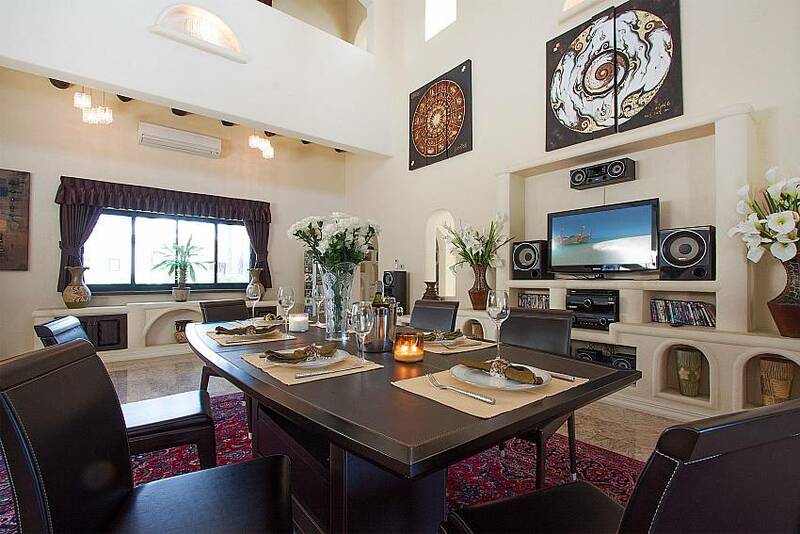 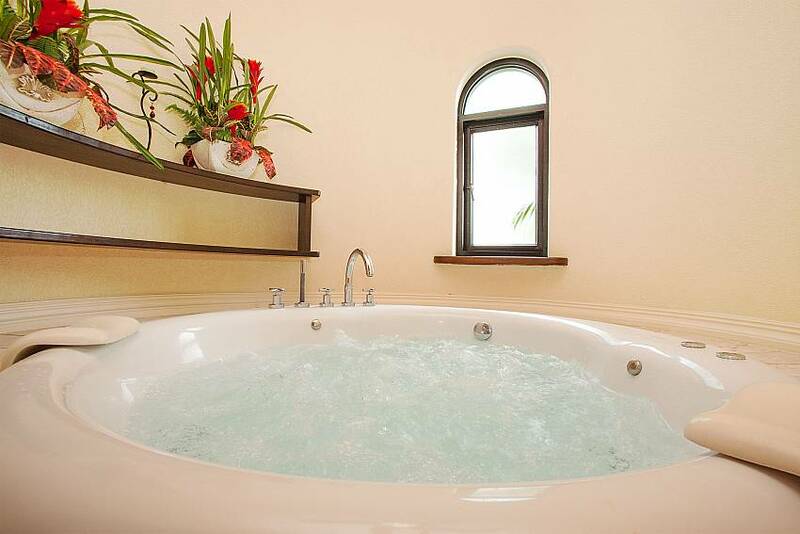 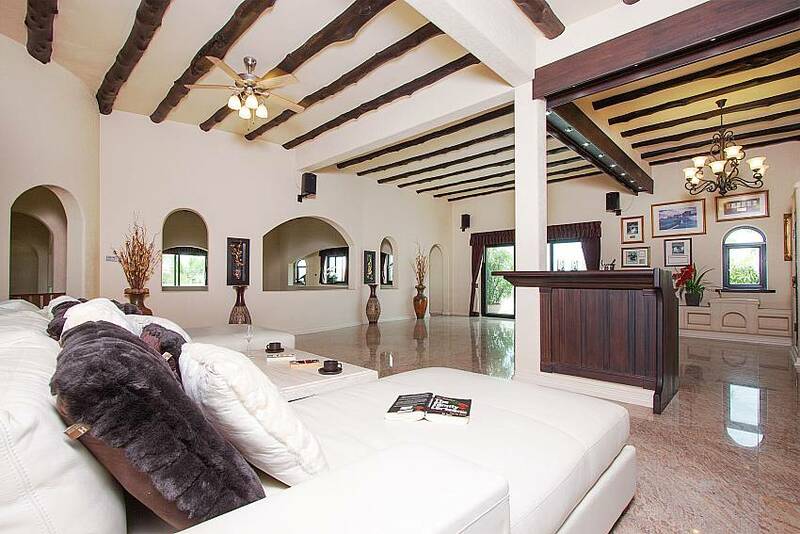 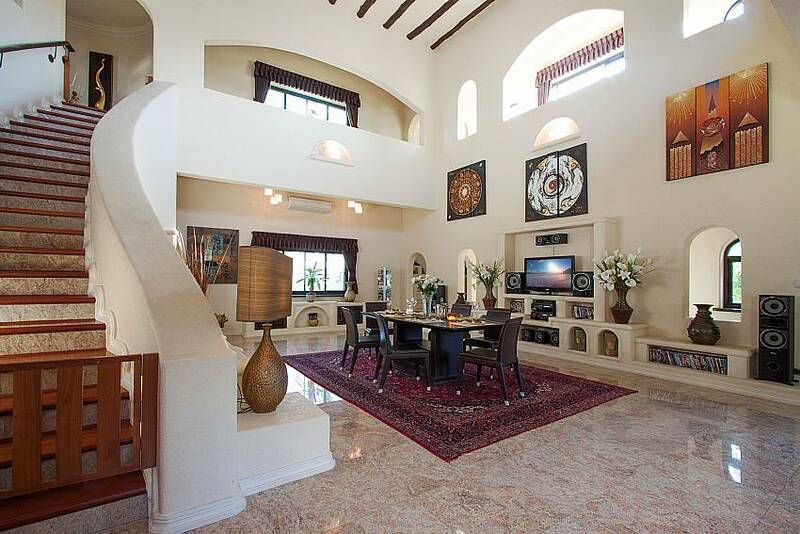 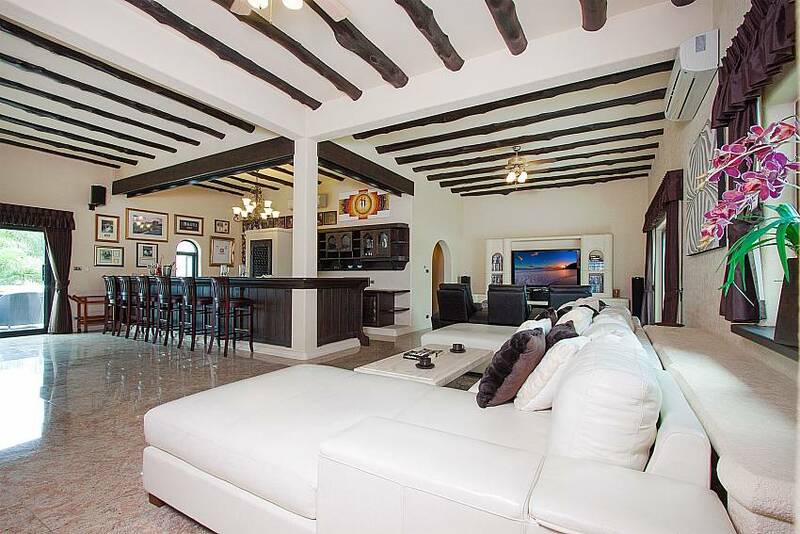 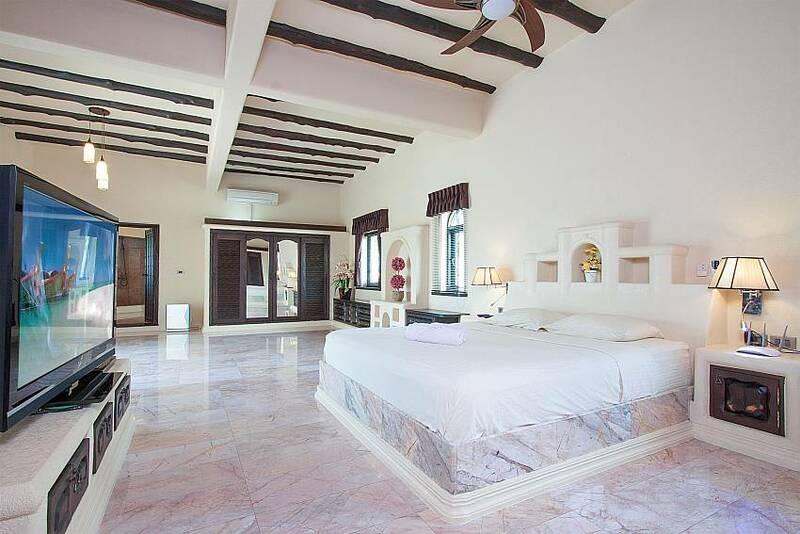 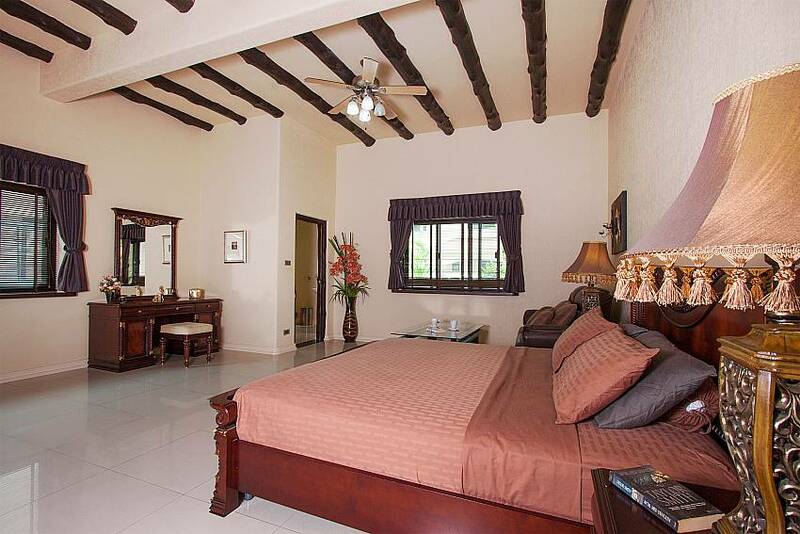 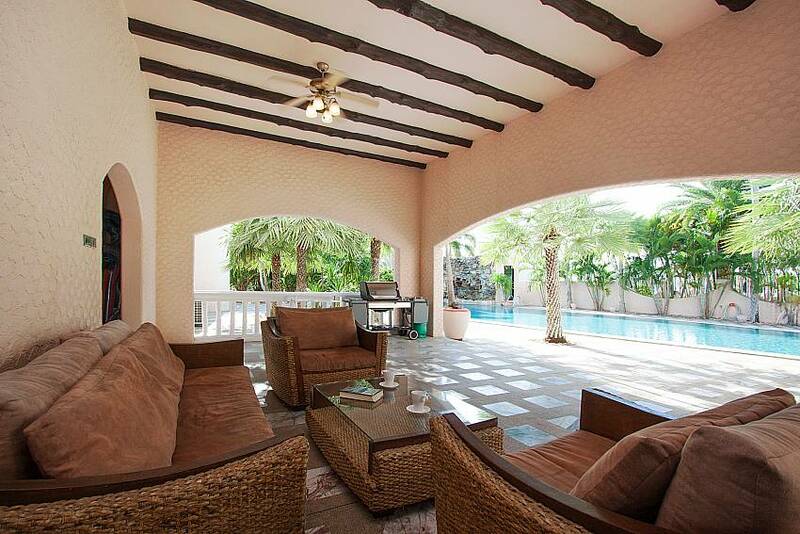 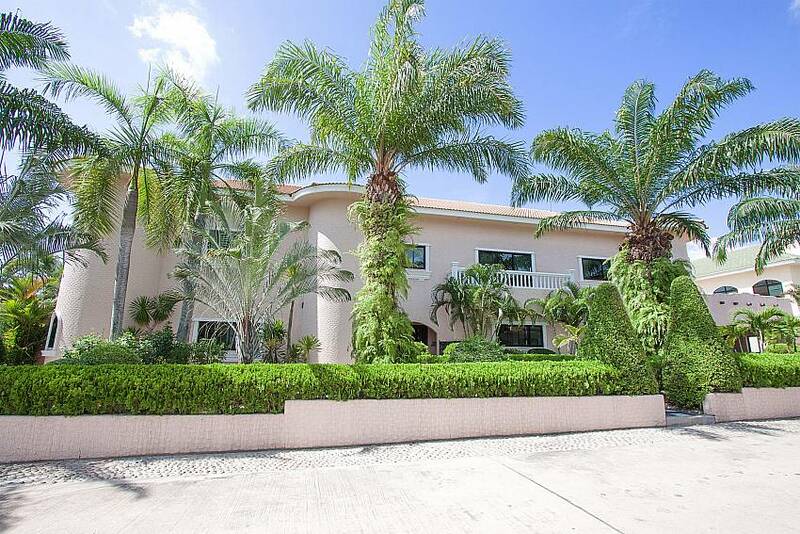 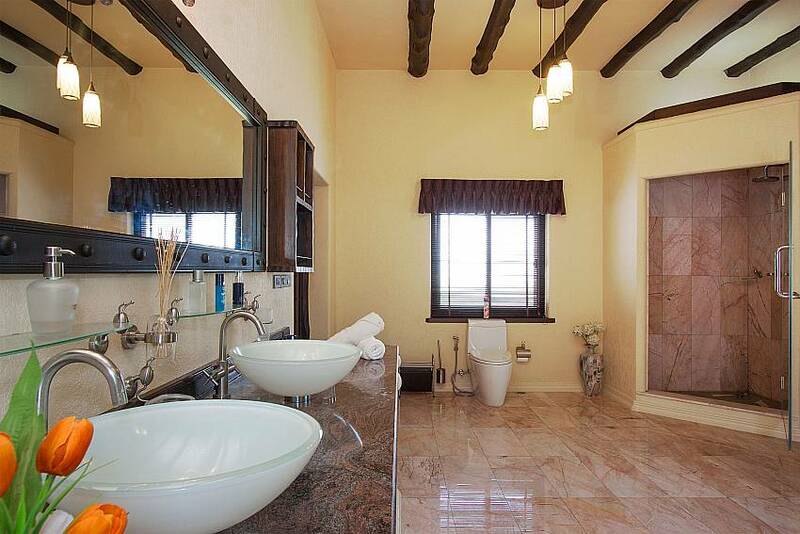 Camelot Villa has 2 floors, 5 bedrooms, 4 bathrooms, and a guest toilet. 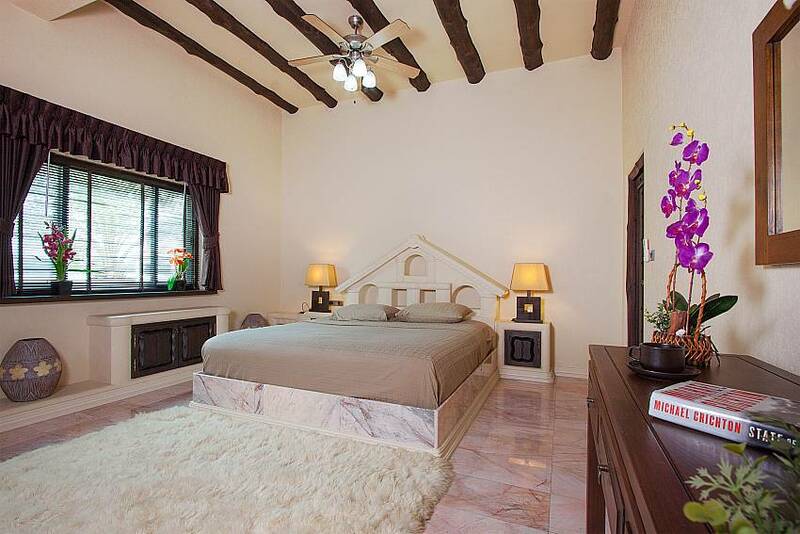 Most rooms are very large and royal-like in terms of design and decoration. 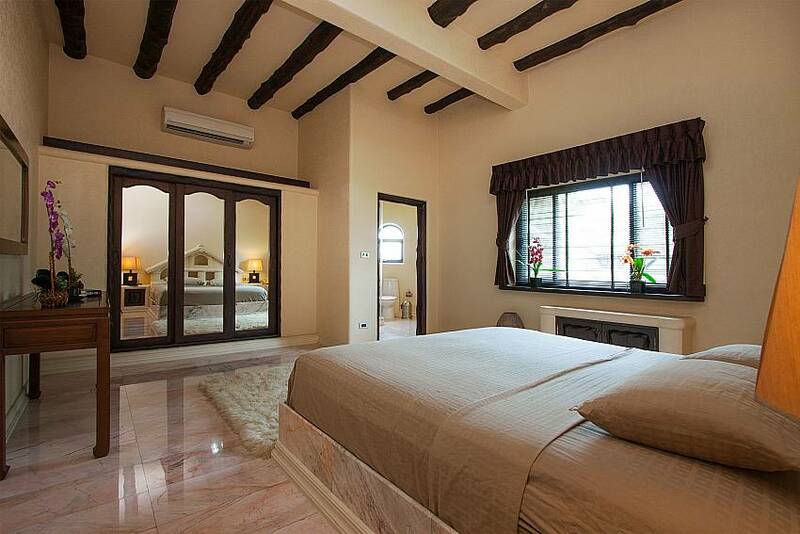 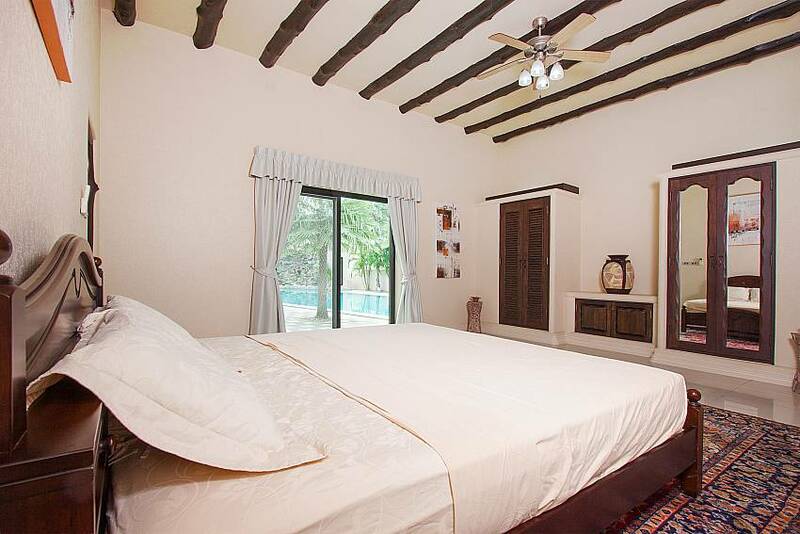 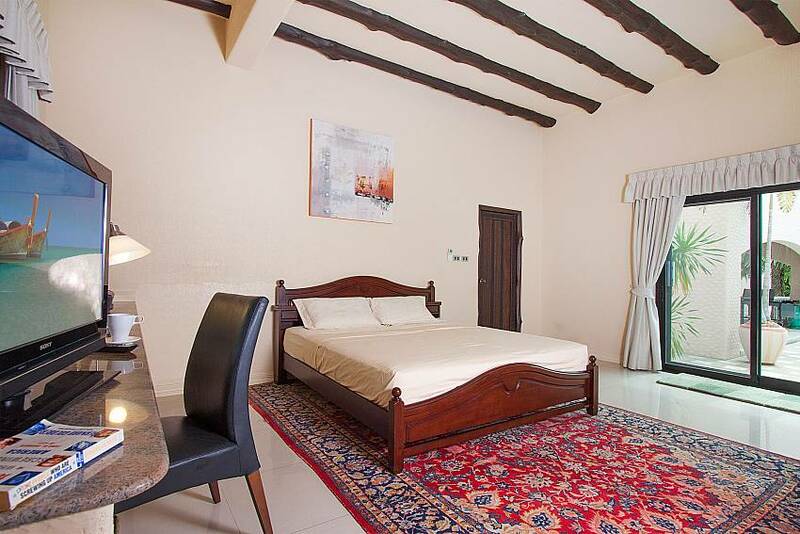 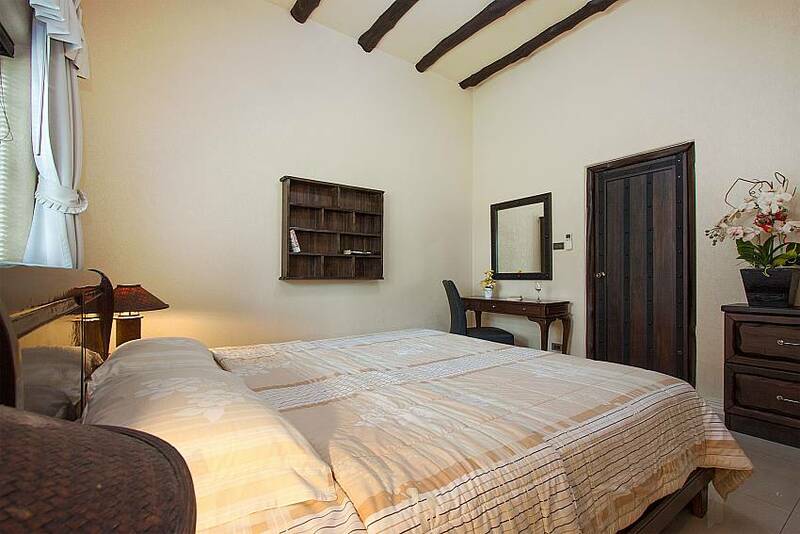 Two of the bedrooms, master and the second one, are located on the villa's first floor. 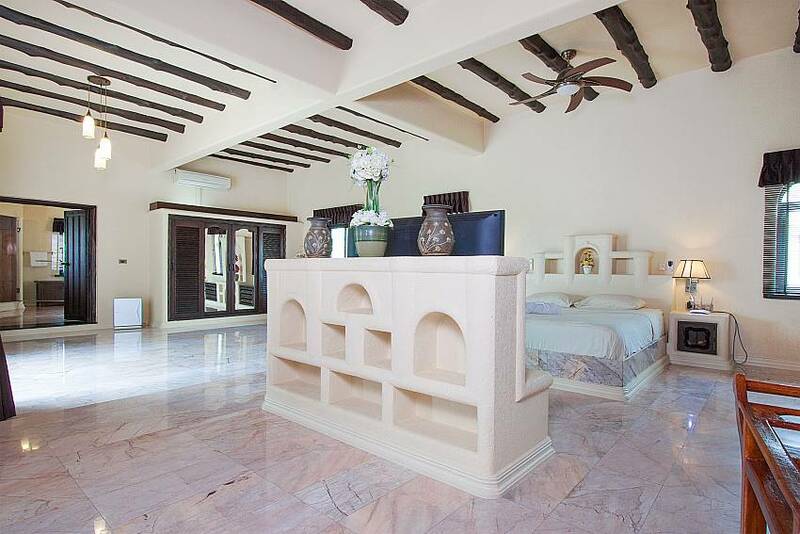 The master bedroom is spacious and grandiose, with a large wardrobe, vanity table, TV with DVD player, and a double en-suite bathroom that has a beautiful Jacuzzi tub. 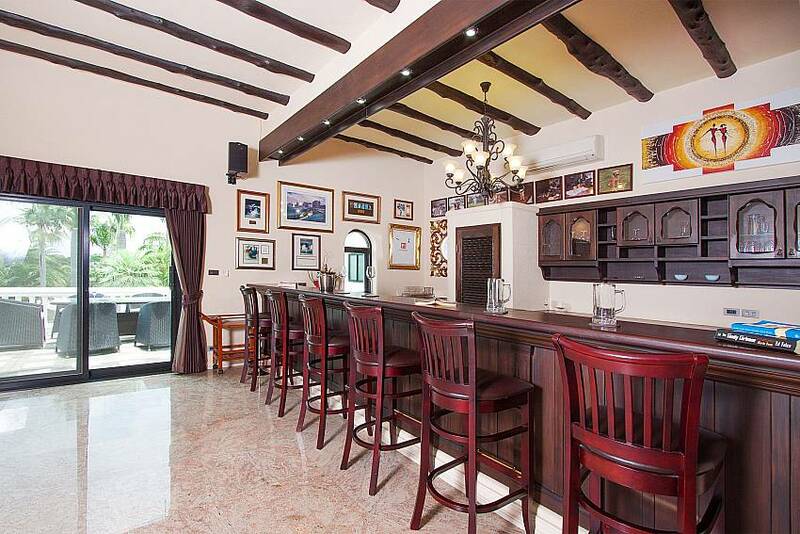 The upper floor is also home to the living room with a bar and comfortable sofa next to a cinema corner with lazy boy chairs. 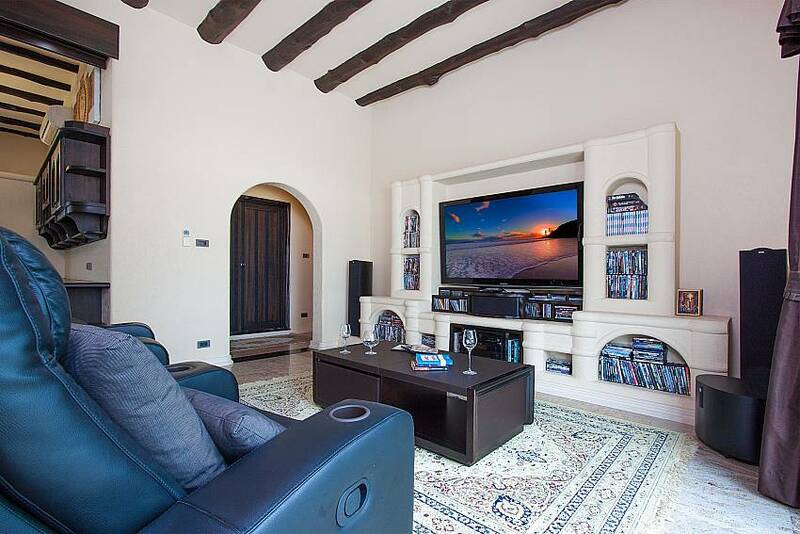 Here you can watch blockbusters on a flat-screen TV with surround system and a DVD player; there is a fantastic selection of movies available as well. 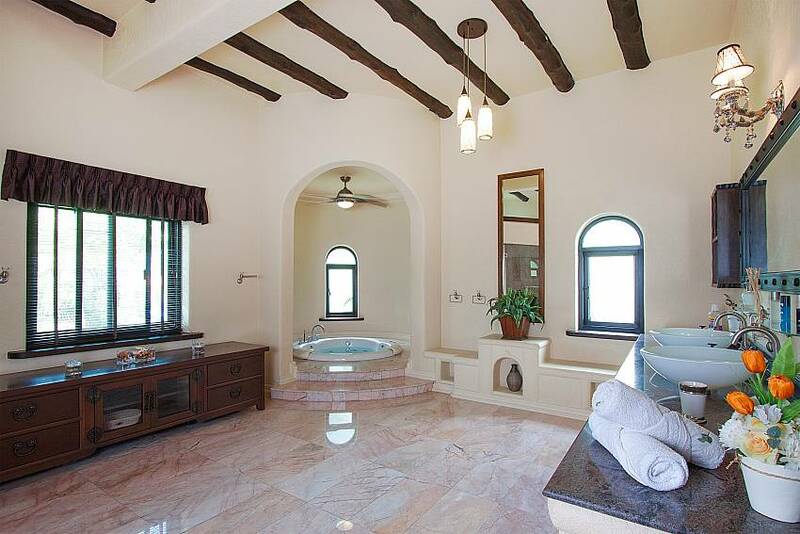 This floor also has a balcony from which you can take pleasure in your morning coffee. 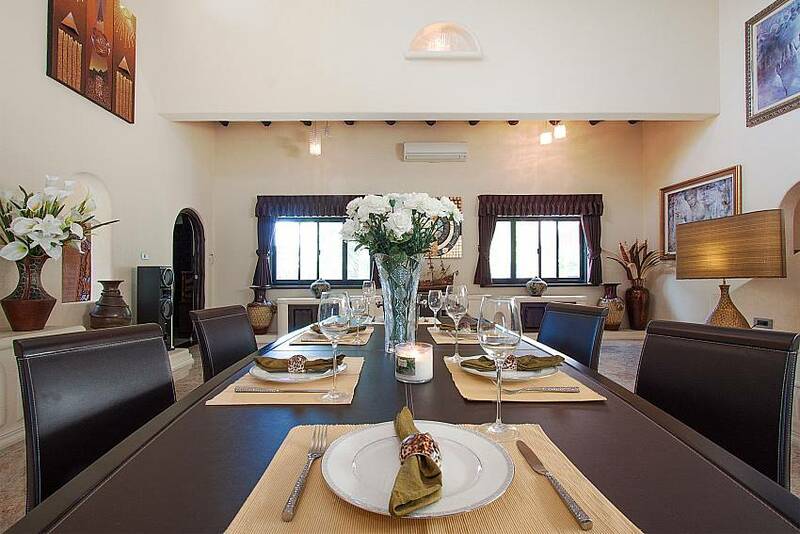 When you enter the villa on the ground level, the graceful dining room will be on your left hand side. 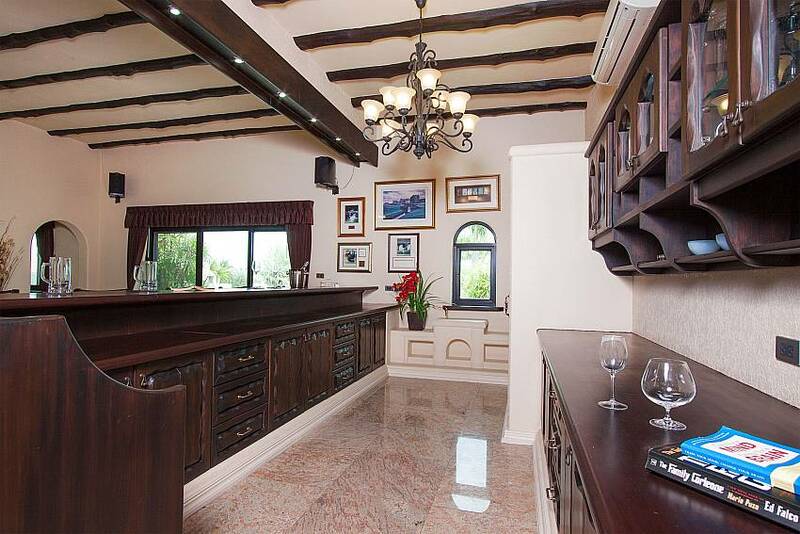 There is a small library in one corner of the room and a wine storage in another, plus a staircase that leads to upstairs. 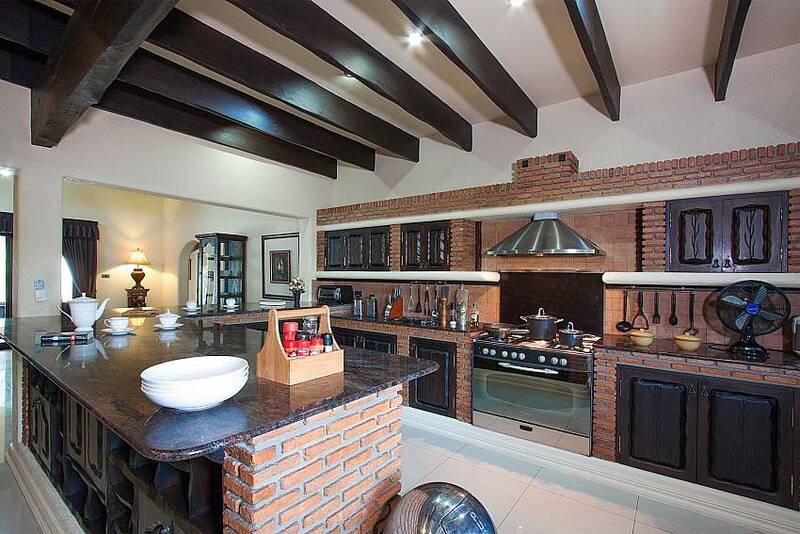 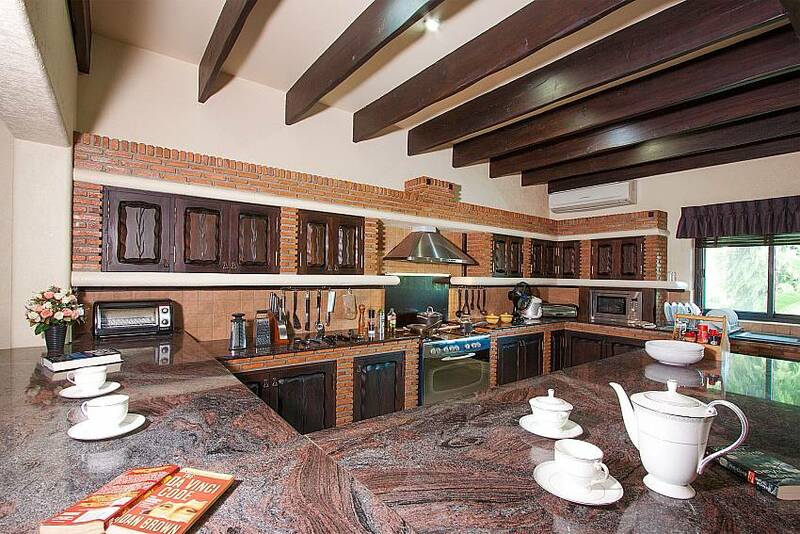 On the right side you will find the large fully fitted kitchen with a small dining table and breakfast bar for 6. 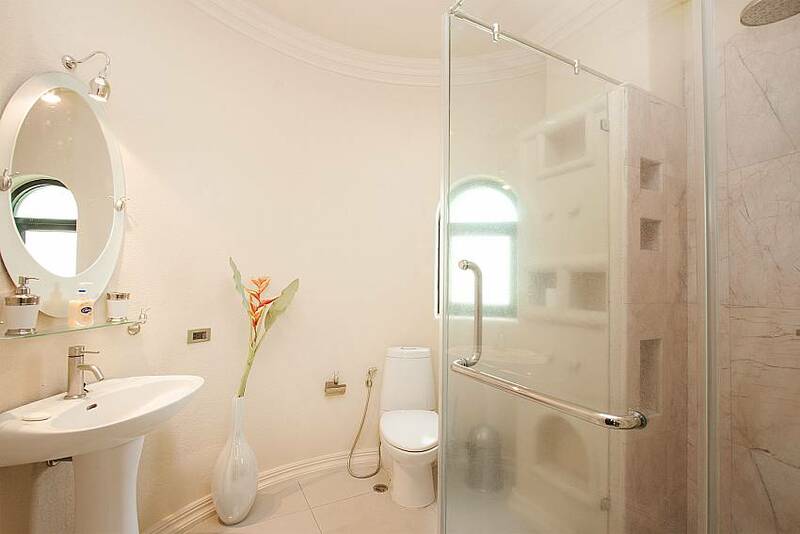 The remaining three bedrooms are past the kitchen; two of them have en suite bathrooms while the third one doesn't so its guests would need to use one of the other en suites. 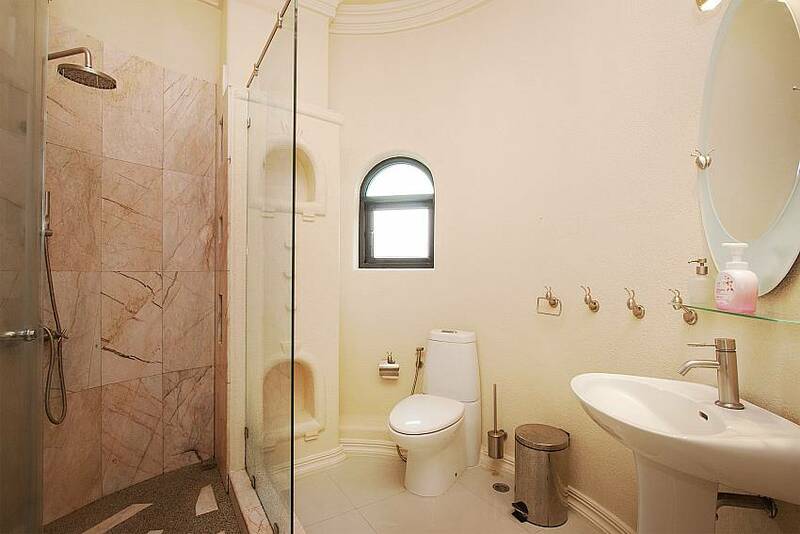 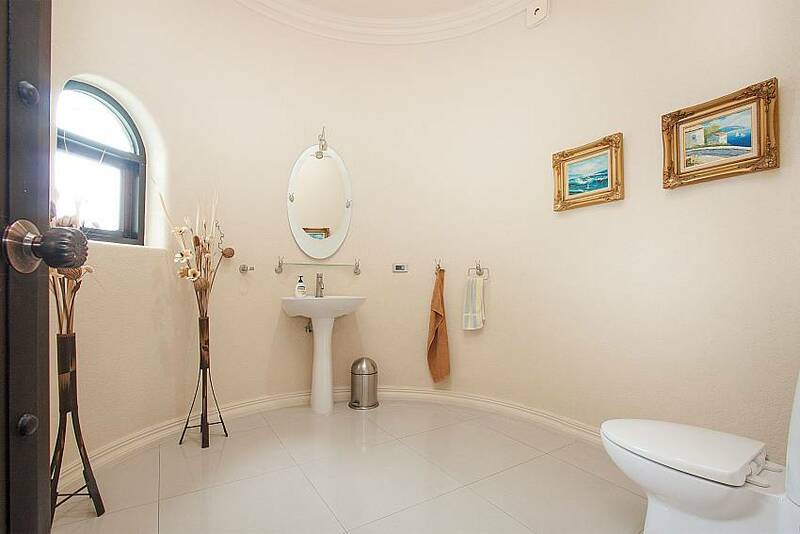 The guest toilet is also located on the ground floor. 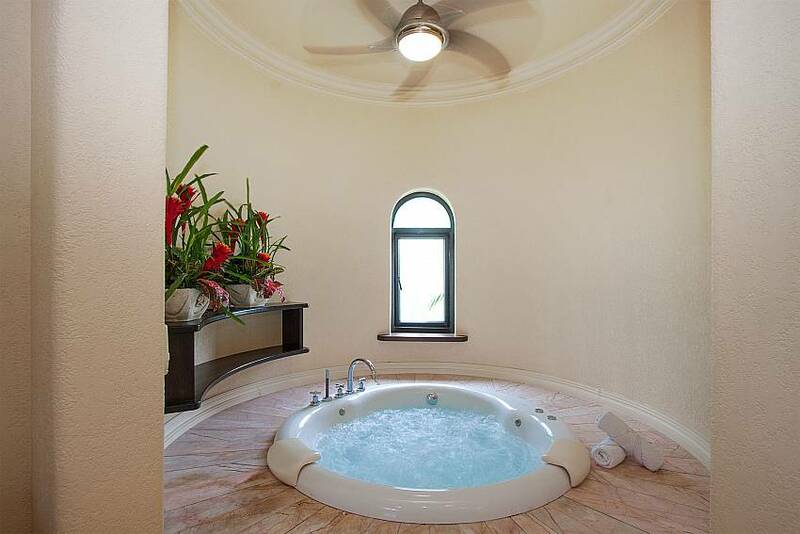 Additionally, Camelot Villa has a glass floor next to the terrace, suitable for having a one-of-a-kind party. 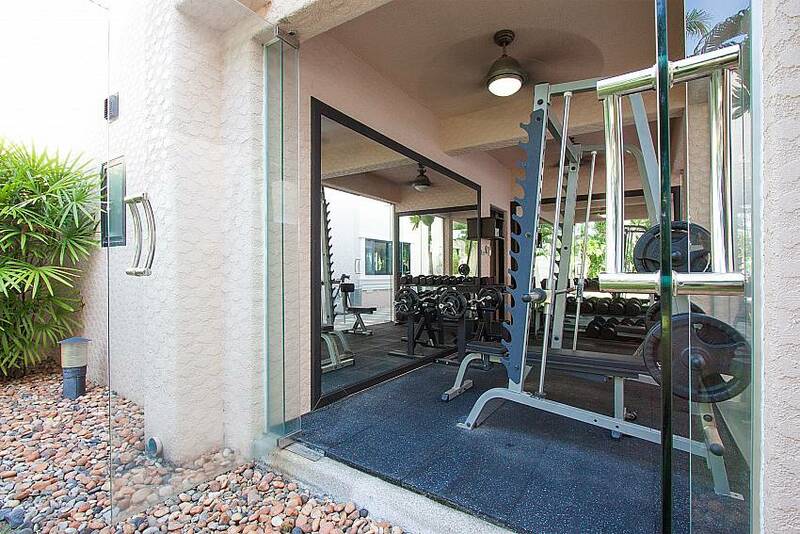 There is also a gymnasium as well as a private garage with an electric gate. 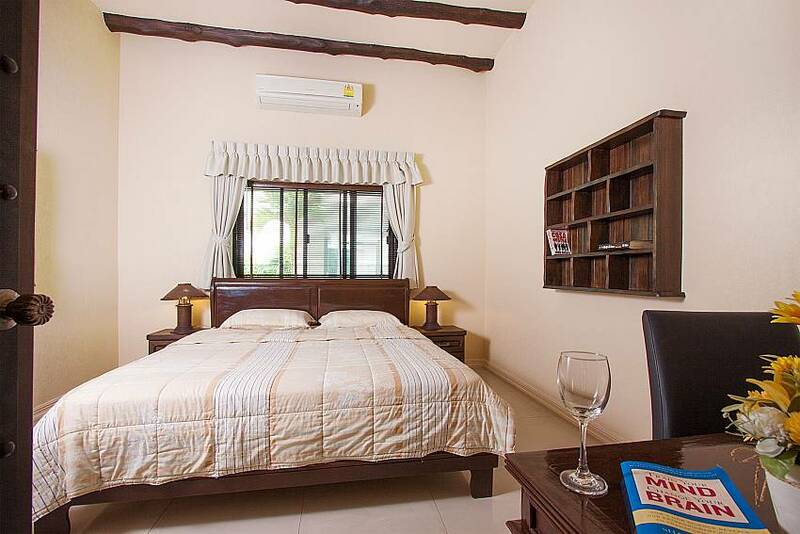 For the guests' convenience a mini-van with driver for 8 hours/day is included in the rent, except for gasoline, parking and toll way fees. 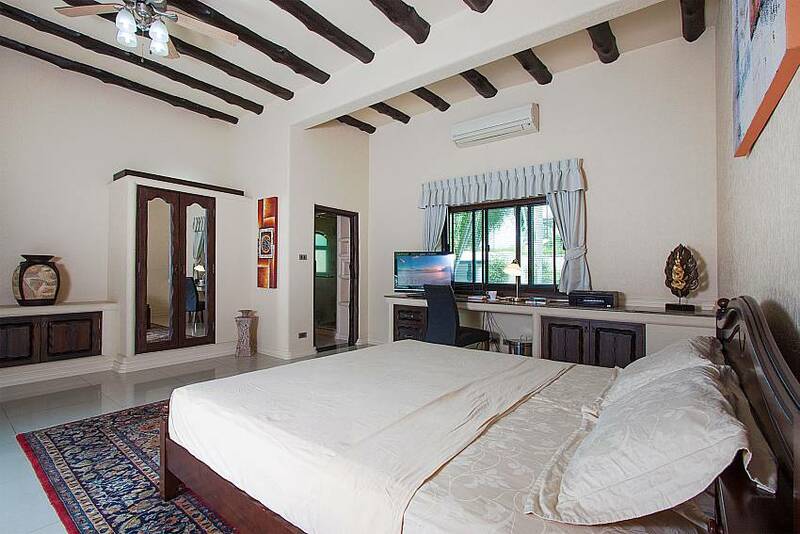 Although you may never wish to leave this self-sufficient holiday haven, you should know that the villa is in a lovely natural setting only 1 km away from Mabprachan Lake. 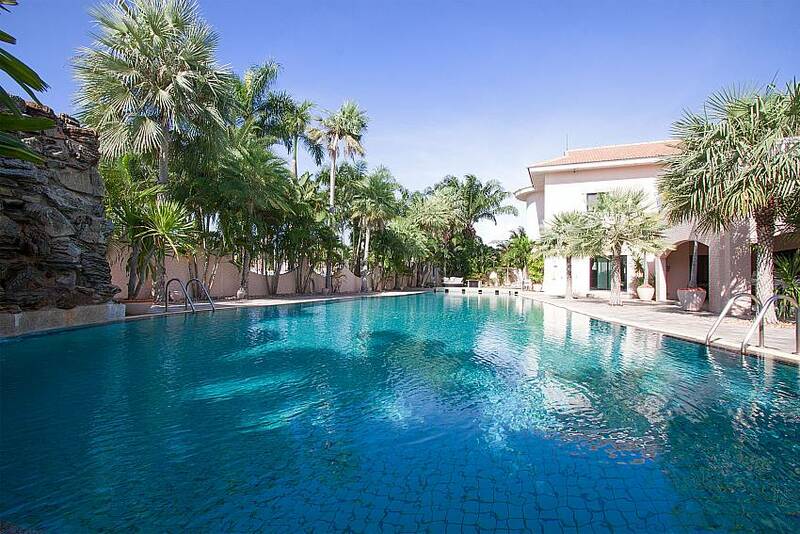 The lake area is packed with international restaurants, forests and parks. 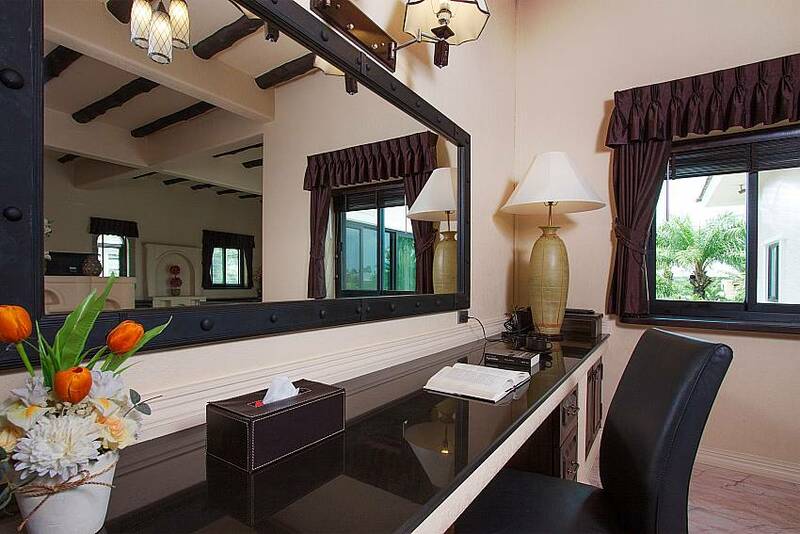 Less than a kilometer away from the villa is Siam Countryclub Golf Course, and about 2 km away is a jungle adventures park, ATV. 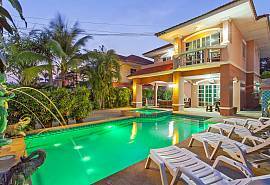 It takes about 20 minutes by car to reach Pattaya Beach and the city centre that are 11 km away. 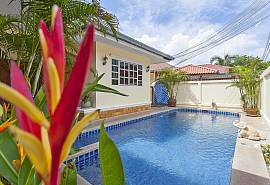 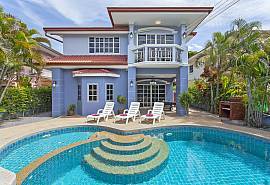 Browse all our fantastic villas in Pattaya here. 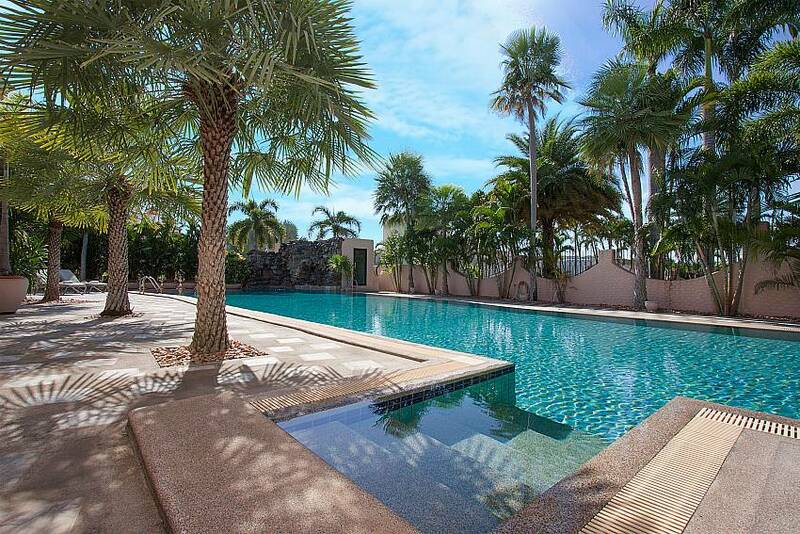 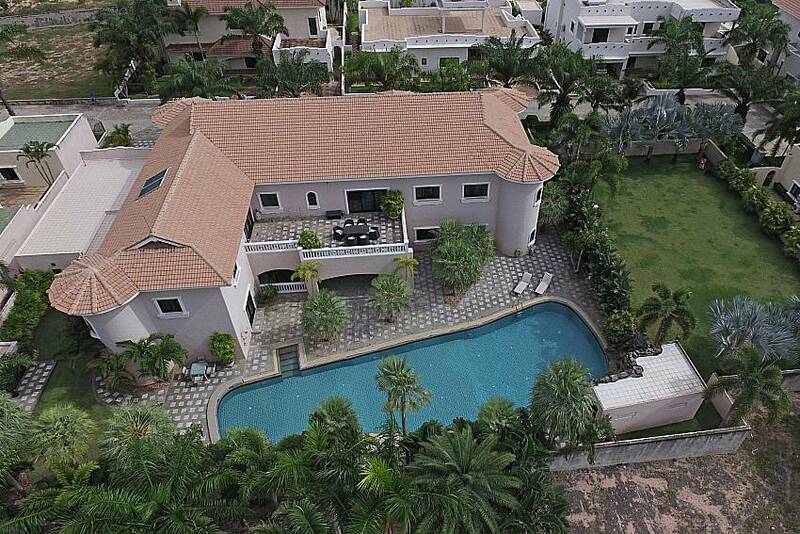 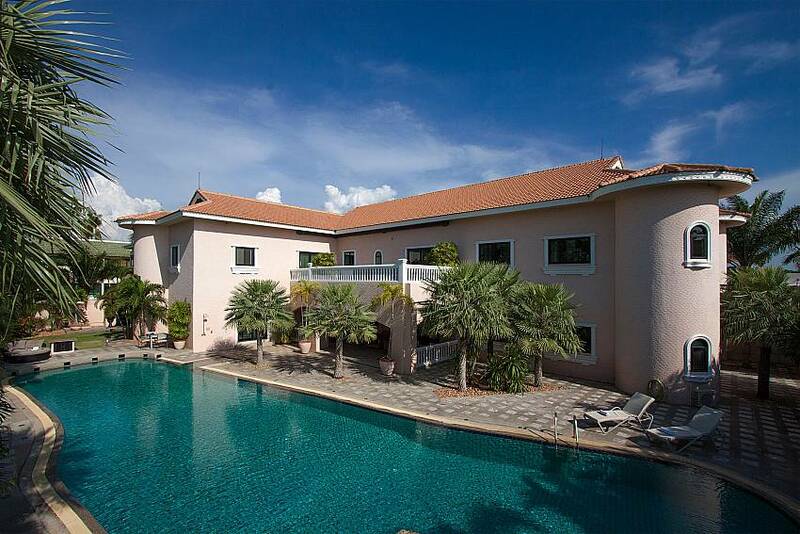 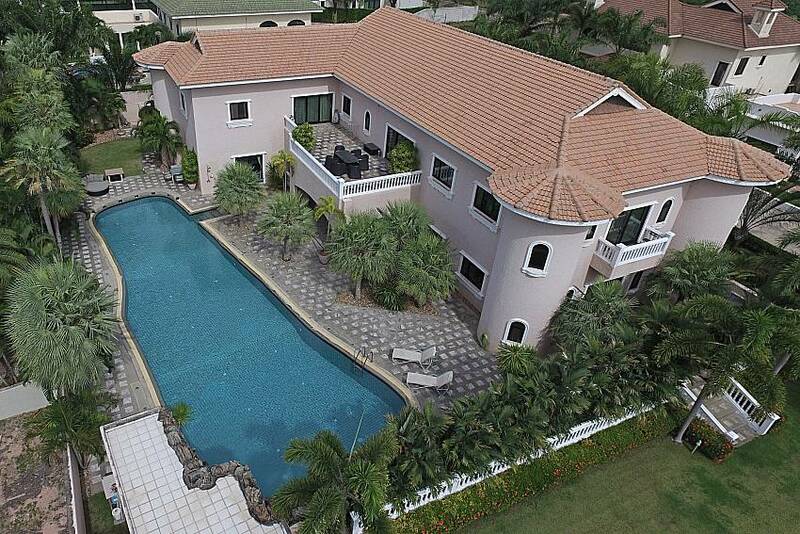 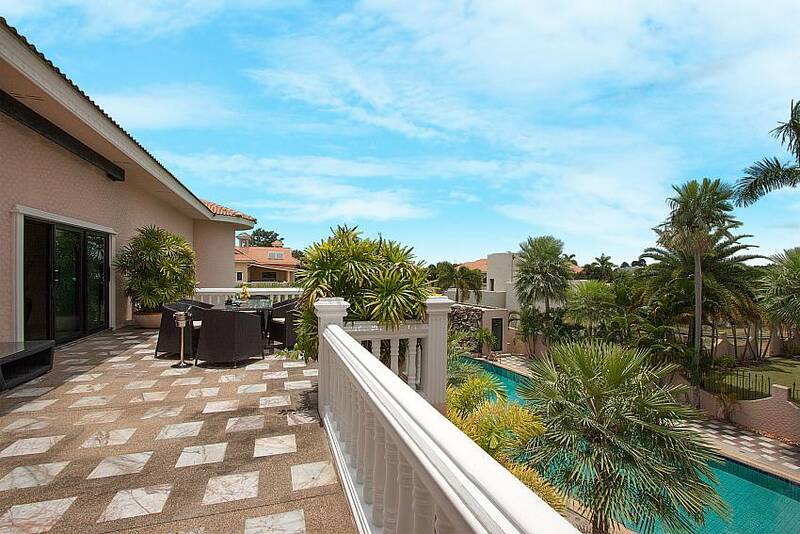 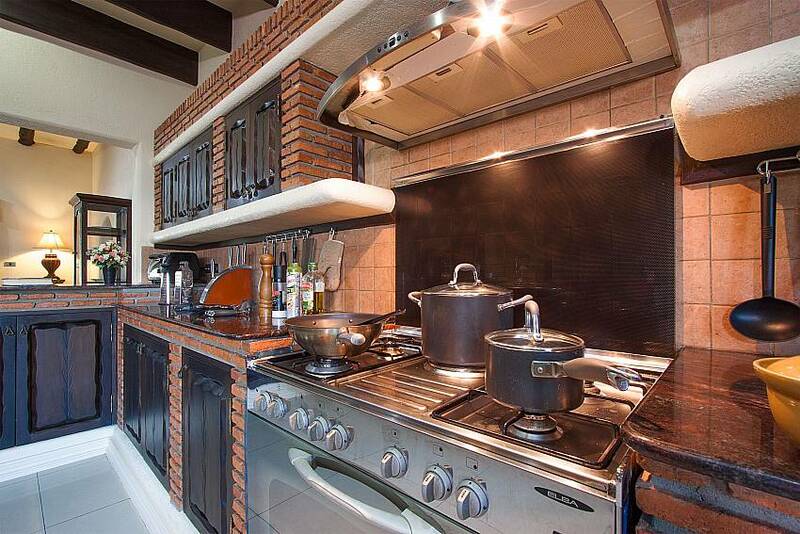 "Fantastic villa in a great location if you want to be around Siam Country Club - not in Pattaya proper. 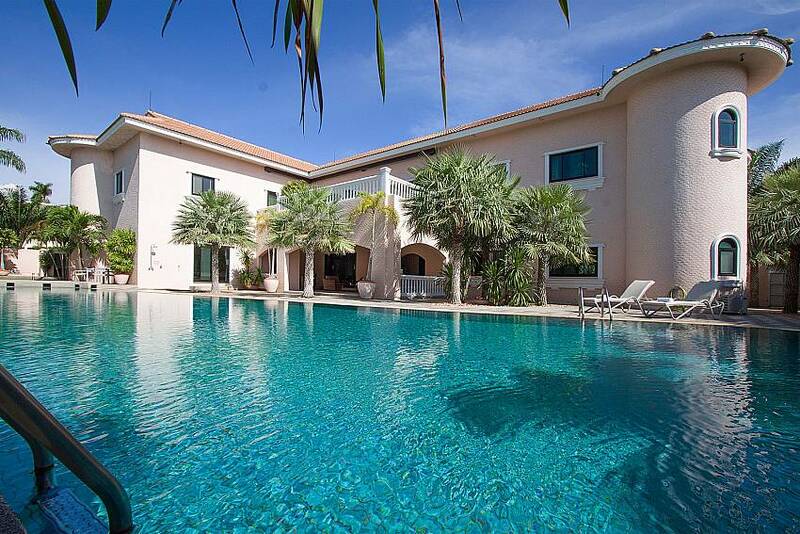 Rooms are great, the pool is huge, we simply had a great time as a group in this villa."